The year is 1945. The war is over and 21-year-old Betty Lake has been invited to Europe to sing in a USO tour for American soldiers who now occupy Hitler’s Germany. The first night’s performance is a hit. Betty becomes enthralled</br> with the applause, the former Nazi-held mansion they’re housed in and the attention of Frank Witt, the US Army Signal Corp Photographer. 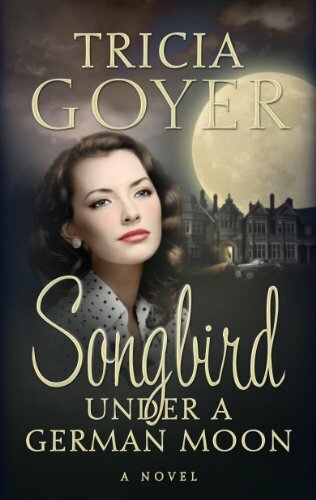 Yet the next night this songbird is ready to fly the coop when Betty’s dear friend, Kat, turns up missing. Betty soon realizes Frank’s photographs could be the key to finding Kat. Betty and Frank team up against post-war Nazi influences and the two lovebirds’ hearts may find the answers…in each other. But will they have a chance for their romance to sing? The truth will be revealed under a German moon. Tricia Goyer writes out of her passion for God and her love for family and others. The author of more than 70 books, she writes both historical fiction and nonfiction related to family and parenting. This USA-Today Best-selling Author has also won a two Carol Awards and a Retailer’s Best Award. She was also an ECPA Gold-Medallion Nominee and a Christy Award Nominee and won Writer of the Year from the Mt. Hermon Christian Writers Conference. Tricia’s contemporary and historical novels feature strong women overcoming great challenges. She recreates historic wartime eras with precise detail through comprehensive research and is a beloved author of Amish fiction, as well, having written the Big Sky and Seven Brides for Seven Bachelors series. Whether for fiction or nonfiction, Tricia’s writing style is vivid and heartwarming, allowing readers to take home more than engaging stories, but also messages that inspire faith and hope. Her goal is to write stories that matter. Tricia is a popular conference speaker. She has spoken at events such as MomCon, Raising Generations, and Teach Them Diligently conferences and been interviewed by numerous national TV and radio programs and magazines. Her new podcast, Walk It Out, can be found on iTunes or downloaded on any podcasting app. Whether through writing, blogging, speaking or podcast, Tricia loves sharing messages of inspiration and hope. A homeschooling mom of ten, including seven by adoption, Tricia is also a grandmother of four and wife to John. With a busy life, she understands the importance of making every word count.